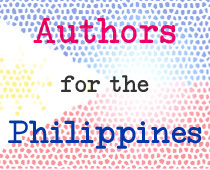 HAVE YOU HEARD OF AUTHORS FOR THE PHILIPPINES? This is an online auction to raise money for the Red Cross’s Typhoon Haiyan Appeal. Typhoon Haiyan slammed into the Philippines on Friday (8 November), causing catastrophic damage. It is the strongest storm ever to make landfall, hitting an area where thousands of people are already homeless after an earthquake in mid-October. I’m spreading the word and also donating a copy of my book. I’d love to bid on a bunch of the items…wait till you see what is being offered! This entry was posted in Authors for the Philippines, Typhoon Haiyan and tagged Auction, Authors for the Philippines, Helping Others, Typhoon Haiyan by viviankirkfield. Bookmark the permalink. This is a great idea. I’ve just made two significant donations to charities supporting rescue efforts. I don’t have a book, but I can look at the bidding. Great idea! Good idea for offering aid. Thanks for spreading the word and donating a copy of your book for auction.